Having rained heavily the day before, Saturday, January 25 turned out to be a beautiful day for our 4th UpStream: Haulover Bridge to Boom, part sponsored by RF&G Insurance. Twelve teams, in seven categories, lined up under the Haulover Bridge and took off at around 9:15 a.m. when the horn sounded. 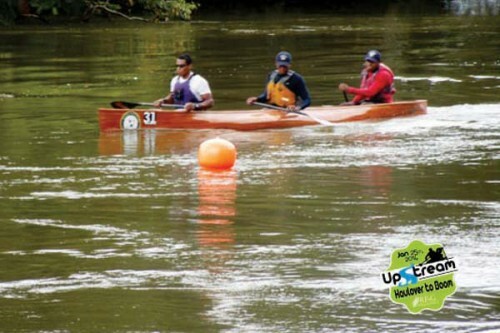 The race was slow, given the high river conditions with strong current which the teams had to paddle against. The maximum speed reached was 5 mph, taken off GPS readings from onboard the Joseph & Taylor STEELers’ canoe. The station prize in front of Manatee Lookout, dinner for 3, was won by the Belize Bank Bulldogs, being the first canoe to reach and pass the location, which was marked by a buoy. Completing the race in 2:23:14 was the Belize Bank Bulldogs (Armin Lopez, Amado Cruz and Daniel Lopez), to capture 1st Male and overall winner. They were followed closely behind by Westrac’s Erwin Cruz, Hener Cruz and Jerry Cante, to take 2nd place Male in a time of 2:34:27. Third place went to Joseph & Taylor STEELers (Jerry Rhaburn, Francis Codd and Chris Guydis). They finished in 2:36:53. The Belize Coast Guard’s “BELIZE” (brothers Godfrey, Jonathan and Jack Alford) took 4th Male and 7th overall, finishing in 2:42:57. The most exciting slow-sprint finish against that current was between the Intramurals Wateva Boyz (Adrian Williams, Sergio Lopez and Jesus Linares), sponsored by D & D Consultancy Ltd., who, by one second, edged out Western Home Supplies, all students of St. Ignatius High School (Alfred Lopez, Byron Cruz and Armando Lopez). They completed the route in 2:40:16 and 2:40:17, for first and second place Intramurals, respectively. In the Mixed Category, first place was Wilberto Daniels, Jayda Guydis and Jermaine Sanchez, sponsored by Black Orchid Resort. They finished in 2:42:26, taking 6th overall. The Coast Guardian – Karl Borland, Tiffara Welch and Glen Jones of the Belize Coast Guard, was 2nd Mixed, finishing in 3:36:17. Belize Rural High School (Matthew Mask, Ashton Moody and Jeffery Seguro) was first Juniors and 8th overall, finishing in 2:56:59. The Grumpy Old Men (Joe Seguro, Stanley Bailey and Jerry Wilken), sponsored by Caribbean Engineering, was first Masters and completed the race in just over 3 hours. In the Pleasure Category, Ernest Santos, Rudolph Gentle and Francisco Perez, sponsored by Print Belize / Ryan Wrobel, was first Pleasure, finishing in a time of 3:18:55. The team most happy to reach Boom was the only Female team that took on the challenge – Pawty Tun Up (Jane Usher, Ana Camp and Bobby D Usher), sponsored by Rt. Hon. Said Musa. That took great courage and they never backed down! Congrats, ladies! Most respect! First, second and third place finishers in their respective categories received a cash prize and medal. NEXT RACE: Hawksworth Bridge to Dream Valley Resort on February 8, 9:00 a.m. race time.